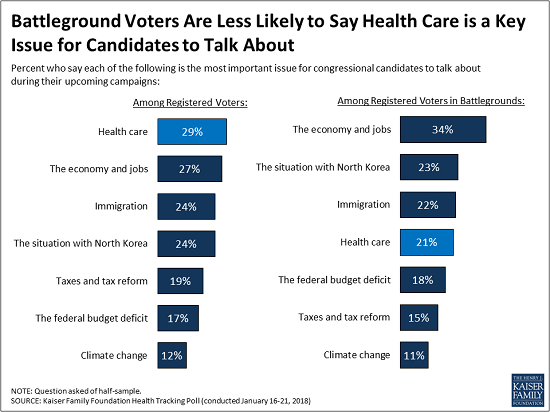 Health care and the economy and jobs top voters’ list as “the most important issue” for Congressional candidates to talk about ahead of November’s midterm elections, but the lineup shifts among voters in states and districts with competitive elections, the January Kaiser Health Tracking Poll finds. When asked how important a series of major national issues are, similar shares say health care (29%) and the economy and jobs (27%) is “the most important issue.” These are closely followed by immigration (24%) and the situation in North Korea (24%). But a third (34%) of voters who live in states or Congressional districts expected to have highly competitive 2018 midterm races (based on The Cook Political Report’s ratings) cite the economy as “the most important issue.” Fewer voters in these battleground areas cite North Korea (23%), immigration (22%), or health care (21%) as the top issue. The poll also weighs the public’s priorities for Washington as Congress continues to work on a budget deal to keep the federal government running past Feb. 8 and address immigration and border security, including the status of the “Dreamers,” who are immigrants brought to the U.S. illegally as children but allowed to stay under the Obama Administration’s Deferred Action for Childhood Arrivals (DACA) program. Providing federal funding for a wall along the U.S.-Mexico border ranks the lowest among eight priorities for President Trump and Congress, with one in five (21%) people naming it as a “top priority.” Several health care priorities rank higher, including renewing the Children’s Health Insurance Program (68%), which Congress did Monday as part of a short-term budget deal to reopen government; stabilizing the Affordable Care Act’s marketplaces (51%); and addressing the prescription painkiller epidemic (48%). Nearly half (45%) of the public say passing legislation to allow the Dreamers to stay in the U.S. should be a top priority. There are wide partisan differences in these priorities. Two thirds of Democrats cite the Dreamers as a top priority, ahead of health care issues including ACA stabilization (61%) and the opioids epidemic (54%). Republicans are about as likely to consider the border wall as a top priority (43%) as they are to consider repealing the ACA (48%), the opioids epidemic (43%), stabilizing the ACA marketplaces (42%), and passing an infrastructure bill (41%). Passing a federal budget to prevent a government shutdown ranks higher (61%). As Congress continues to work on a federal budget, few Americans – regardless of party identification – want to see reduced spending on Medicare (7%) or Medicaid (12%). However, the poll also finds that the way spending on such programs is framed can affect the public’s views. 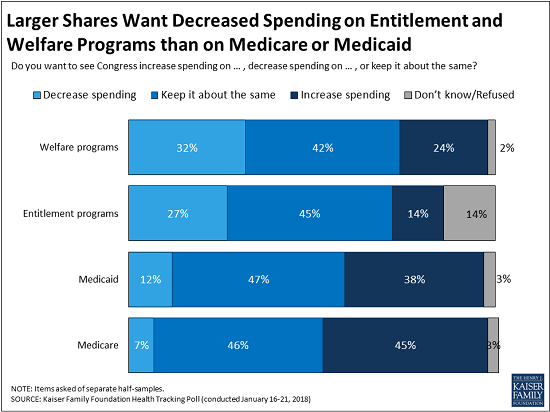 When asked about government spending using more loaded terms like “entitlement programs” or “welfare programs,” larger shares say they want to see spending decrease (32% for welfare programs, 27% for entitlement programs). A clear majority of the public (69%) view Medicaid primarily as a government health insurance program that helps people pay for health care, compared to one-fourth (27%) view it primarily as a welfare program. There are partisan differences, with overwhelming majorities of Democrats (82%) and independents (72%) viewing it as insurance, and Republicans divided with a narrow majority (51%) saying it is insurance and nearly half (46%) saying it is welfare. The poll also assesses the public’s awareness about the repeal of the law’s individual mandate provision effective in 2019 through the tax reform law enacted in December. The mandate, which requires most Americans to have health coverage or pay a tax penalty, has consistently polled as the ACA’s least popular provisions. About one third (36%) of the public are aware that Congress repealed this requirement, while nearly half (46%) incorrectly say that the requirement has not been repealed. The rest (18%) are unsure if it was repealed or not. The results are similar among those who are most likely to be affected by the change – those who are either uninsured or buy their insurance through the individual market. The poll also finds that most Americans do not plan to spend their tax refund on health care they have been putting off. When asked what they would do with a tax refund, four in ten (44%) say they would use a tax refund to pay off a bill or debt, while a third (36%) say they would save or invest it. Few (7%) say they would spend it on something they have put off, including just 1 percent who say they would use it for health care that they put off. Designed and analyzed by public opinion researchers at the Kaiser Family Foundation, the poll was conducted from January 16 – 21, 2018 among a nationally representative random digit dial telephone sample of 1,215 adults. Interviews were conducted in English and Spanish by landline (433) and cell phone (782). The margin of sampling error is plus or minus 3 percentage points for the full sample. For results based on subgroups, the margin of sampling error may be higher.